The puffed silk pocket square is the standard for those who wish to add a splash of colour in their breast pocket instead of the staid folded white linen handkerchief. To create a puff, lay the handkerchief flat and pick it up by pinching it from the centre. Slide it though your hand to gather it together, turn up the bottom and place the pocket square in your breast pocket. Once in the pocket you can adjust the pocket square to puff it up. 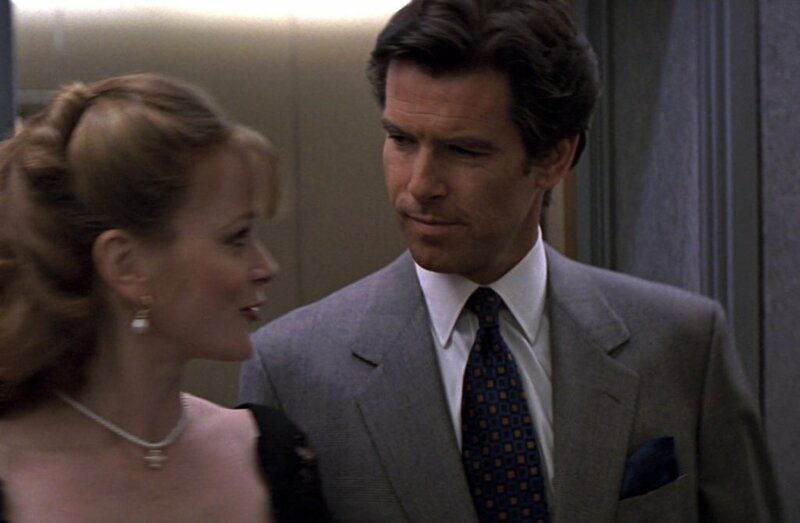 In GoldenEye, Pierce Brosnan wears solid pocket squares that pick up one of the colours in his tie. In the M’s office scene, Brosnan matches a medium blue pocket square to the medium blue squares in the tie (right). A light brown or gold pocket square would also have been a good choice to echo the tie’s light brown squares. In the Q’s lab scene he wears another medium blue pocket square that is lighter than but still echoes the base colour of his tie. It’s the easiest choice to match the tie’s base colour, but it would be more interesting if Brosnan matched his pocket square to the red or yellow in the tie. He again wears a medium blue pocket square with his navy birdseye suit in Russia, which subtly echoes the lighter blue in the birdseye weave. In The World is Not Enough, Pierce Brosnan wears a rather unexciting grey puffed silk pocket square with his pinstripe suit, but it echoes both the grey in the tie and the suit’s pinstripes. It’s a smart match whilst at the same time is subtle enough that it doesn’t look too studied. 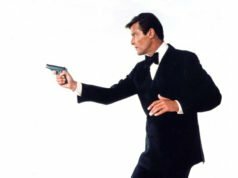 Brosnan was no stranger to wearing puffed silk pocket squares in GoldenEye. 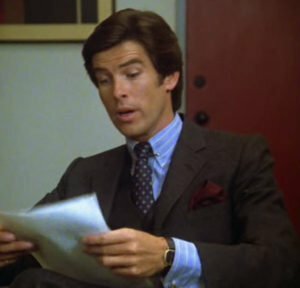 He consistently wore them in Remington Steele, but then he most often went for the uninspired method of matching the pocket square to the base colour of his tie, and he occasionally matched his pocket square to his shirt as well. There were some exceptions to that, like in the second season premiere “Steele Away with Me”. Brosnan uses a red pocket square to echo the pink spots on his tie. It complements the outfit without looking too studied. But this method of matching the pocket square doesn’t only apply to matching with ties. Pocket squares can also be effectively used to echo the colour of a stripe or check in a shirt or a suit. Brosnan also could have worn a yellow pocket square to echo the stripes in his shirt. 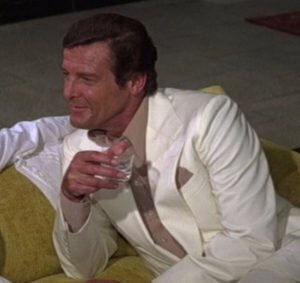 Roger Moore shows in Moonraker how not to wear a pocket square, with his cream suit in Rio de Janeiro. He wears a light brown pocket square that’s such a close match to the shirt it’s probably made from the same cotton. Daniel Craig’s matching light blue pocket square and shirt aren’t so bad because they’re in a very neutral colour, but Moore’s shirt and pocket square are far more noticeable. A pocket square should not be an exact match to any other part of the outfit—unless it’s white or otherwise very neutral—or else it looks amateurish and unstylish. 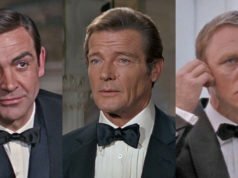 It’s a shame that Moore’s only pocket square in his seven Bond films is a failure since Moore is otherwise one of the most creatively-dressed Bonds. Matching a patterned pocket square with a patterned shirt or tie can be difficult because there can often end up being too much going on. Wearing a patterned pocket square that has the same colours as the tie is almost as bad as wearing a matching tie and pocket square. If you find yourself often without a tie, a patterned pocket square can often be the best option since it can add the interest that is lost without a tie. And no, there is no rule about not wearing a pocket square without a tie. I’ve never been a fan of the style that is seen in the first two photos. I can understand why someone may not like a look which is too “matchy-matchy”, but the gulf between the pocket squares (are they still squares if not folded into a square shape? Pocket puffs?) and the rest of the outfit is too much for my tastes. I understand the *idea* of matching or picking up colours from the tie, but it seems more like a notion than a reality in the first two photos. It’s called a pocket square because that’s the shape it starts out as. I prefer the tv fold to the puffed silk handkerchief with a suit. Something about the latter is too affected for my rather staid taste. However, with a sport coat and no tie, I like the idea of a patterned silk pocket square. I have never worn this look, but I think I’ll try it in the near future (although I doubt it’s something we’ll ever see on Bond). It’s funny you say that, as proponents of the puffed silk pocket square make the same argument! From Roger Moore’s example above, I can see what you mean by matching the square and the shirt too closely can look somewhat “off”. The brown of the shirt is not a very common color so the square will most probably be from the exact same material as the shirt. It seems to me that silk pocket squares in colorful shades look better in a puff rather than a fold. 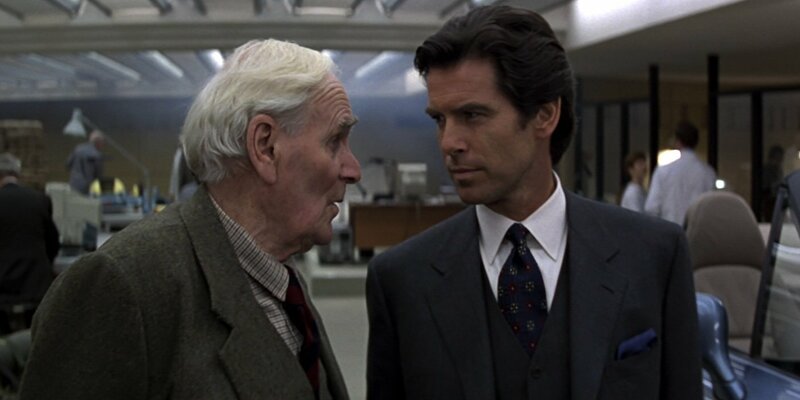 Brosnan seems to wear this kind of fold both as Bond and Remington Steele. Is it safe to assume that it is actually his preference to wear pocket squares this way rather than the costume designer’s? Brosnan wore the puffed pocket square very well, with his first dinner jacket too. Not a big fan of this puffed pocket square look – too dandyish for my tastes. The TV fold is much better, though I used to think it too old-fashioned. Brosnan looks way to frail here, and, while I love the scene where Moore gets off the plane in Rio and heads to the Copa, this scene on the couch is just cringe-inducing, even for 1979 (or 1959). Roger was getting too old to pull it off with such a young woman by this point. And the clothing doesn’t help. Regarding Sir Roger’s kit; would it be more OK, had he worn a brown pocket square in silk rather than the same cotton as the shirt or is it the overall match that is wrong? It’s the perfect matching that’s wrong. Brown silk could work, provided it’s not the same shade as the shirt, though something different would be better. Personally, im an user of both, the presidential fold with my cotton white handkerchiefs and the puffed fold with the silk ones. That gray/white/blue look at M’s office is just phenomenal, those colors harmonize beautifully and is a look i like to use myself.